Recruit Holdings Co., Ltd. (Headquarters: Chiyoda-ku, Tokyo; President and CEO: Masumi Minegishi) announces that, from April 2018, its wholly owned Asian subsidiary, RGF Hong Kong Limited (“RGF”; Headquarters: Hong Kong; President: Takashi Kuzuhara, www.rgf-hr.com/ ), will integrate its brands and strengthen organizational governance to enhance its range of permanent recruiting services, from executive to staff, across Asia. 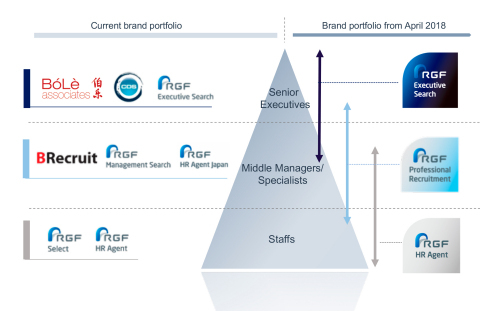 RGF’s seven existing brands will be integrated into three service brands: RGF Executive Search, RGF Professional Recruitment, and RGF HR Agent. − RGF Executive Search: Executive search brand aimed primarily at foreign-owned and local companies seeking leaders for senior executive to mid-level management roles. − RGF Professional Recruitment: Recruitment brand aimed at personnel for mid-level management to specialist roles. Will enable foreign-owned and local companies to find the best local, bilingual staff quickly from RGF’s extensive jobseeker database. − RGF HR Agent: Aimed primarily at Japanese companies with offices abroad and positions that require Japanese or Japanese-speaking personnel. Will draw on a deep understanding of Japanese companies and vast database of Japanese-speaking personnel to find the best candidates. “We want clients and candidates to know they can expect the same world-class service from us in all the markets where we operate, so we’re excited about aligning all of RGF’s businesses in Asia under these three clear, focused service brands,” says John Tucker, Regional Head of Southeast Asia and Japan. In response to the rising need for full-time employees in Asia, RGF began offering Japanese-speaking recruitment services in Shanghai in 2006 as part of the Recruit Group’s international operations. As business expanded in the region, RGF also acquired CDSi (Japan) in 2008, Bó Lè Associates (China) , BRecruit (China), and the franchise operations of a leading search firm in India in 2013. Through a local-to-local focus on the permanent recruiting market in each individual city and country, the company has helped make the optimal match of personnel to companies. Today, it provides services in 11 countries and markets, and 26 cities, drawing on local market knowledge amassed over many years, as well as broad networking capabilities. In Asia, the company has placed over 40,000 personnel—from executives through to staff, establishing a strong reputation as a trusted recruitment services provider. The rapid shift toward localization at global companies and globalization among local companies in Asia has fueled substantial growth in the permanent recruiting market. Demand for employment from people who wish to acquire global experience, regardless of job function and tenure in the workplace, is also on the rise, and this trend is expected to accelerate. Through its range of permanent recruiting services, from executive to staff, RGF aims to deliver optimal, cross-border recruitment solutions that transcend national and city boundaries. RGF will integrate its service brands to match the characteristics of target market participants, both jobseekers and companies seeking to hire. RGF will also strengthen organizational governance in conjunction with this move. Enhancing RGF’s services in this manner will enable recruitment officers to search for the best personnel at every level from across all of Asia through its closest regional location. It will also rapidly connect jobseekers with opportunities for career advancement across national and city borders. RGF Talent Solutions Singapore Pte. Ltd.